Sooo sorry for the lack of posting. I won’t get into the details but things have been crazy but I fully intend on keeping up with the snacks. My stupid non-snacking life takes over sometimes. Anyway, I’m not usually a fan of pre-made canned salads, I’ve seen other offerings like chicken and ham salad in a can too, maybe even egg, but I hope not. I have my suspisions that one of these two owns the other but could be wrong, it just seems to be the trend that eventually one company will make everything. I just thought it was mildly interesting that the color and gradient on the packaging are exactly the same. I could get right to the point and just say gross, no more please but I’ll use a few more adjectives. Ethan described this as “soupy” not in the consistency so much (although it applies somewhat) but the taste was like canned soup. You know that “dead” taste of things that used to be fresh and are transformed into a bland, tasteless, shelf-stable version of it’s former self, like canned spinach, asparagus, etc.. I thought I detected some tomato flavor and assumed from the texture and taste those reddish-orange bits were tomoato but they were infact carrot. Pretty gross all around, didn’t taste like tuna so much as mayo and transformed carrot and celery. Different but the same. Very slightly better in the way that this tasted more like “normal” tuna salad. Same deal with the texture but we found this less offensive enough to not make a face when we ate it. This also had considerably less carrots and no tomato-like taste. Brunswick wins for being less disgusting, although not by much. Needless to say I’m not feeling very good right now and drinking a Tab to hopefully burn away any funkiness going on in my stomach (that’s what I’m telling myself). Glad to see you back ‘n’ snackin’! Your suspicions are correct: Bumblebee was purchased in 2004 by Connors Bros. Income Fund, a Canadian company which produces Brunswick, Beach Cliff, and Port Clyde sardines. With its acquisition of Bumblebee, Connors has become a near-monopoly in canned fish snacks in North America. WRT packaging, it’s not just the colors and typefaces on the labels that look suspiciously close. Look closely at the photos on the packages. 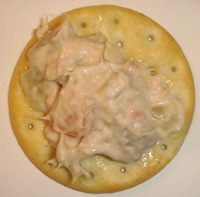 They’re identical, right down to the pile of tuna chunks on the cracker – the company just used one stock photo and then Photoshopped the can labels in the picture. Looks like nasty stuff all around. Starkist is good, though. I buy their little lunch packs pretty regularly, in fact. I think it helps that you mix the elements yourself — the tuna, mayo, and relish all com separately and you mix it to your own taste. Carrots? Since when have there ever been carrots in tuna salad? The Bumblebee chicken salad one is a lot better! There’s no option for that, it’s already mixed up together in the can when you open it. Exactly the same. The Brunswick package says “Distributed by: Bumble Bee Foods” on it. And hey for $1 from the Dollar Store these aren’t that bad. I like them both and I think they taste great!! Some people love a lil’ mayo in their tuna. Plus, it’s a good and quick snack. I very recently discovered these little BRUNSWICK goodies in the Tuna/Chix’n snacks. The darn Dollar Store I buy from cant keep them in stock quick nuf for me….I absolutely love them. (Tuna being my favorite). Having been hungry once in my life…appearance of food doesnt necessarly mean a lot to me. The taste is what I go by and my Brother and I think they are just the greatest for a good snack. I like mine, actually, on a fresh piece of Italian bread with little butter. I hope BRUNSWICK does not stop marketing these items for years and years. Are these tuna salad?! And I’m with you,snackgirl. I do not like pre-made canned salads. Check that. I don’t really like salad at all!! Either of these snacks are gross unless they are cold and the ham one is the best of all of them. 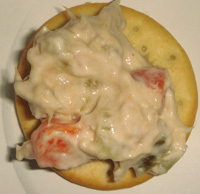 I just ate a package of Brunswick Tuna Salad with Crackers. I found it to be Very Good. I especially liked it’s convenience . I give it an A-. I would eat it again. 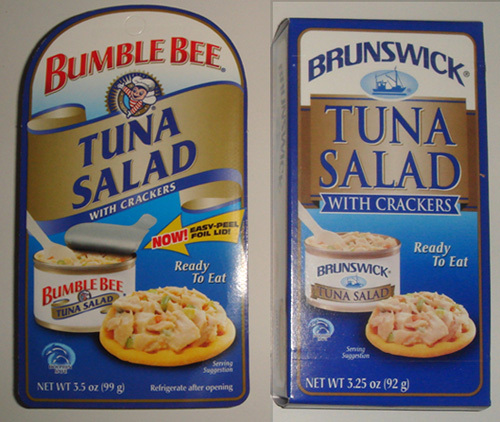 Enjoyed the Comments…..
Brunswick and Bumble Bee chicken and tuna salad snack packs are the EXACT same product. The only difference is the distribution. Brunswick is distributed to budget stores like Dollar Tree, Big Lots and K-mart while the Bumble-Bee brand is used for grocery chains like Kroger and Wal-mart. Don’t be fooled. It’s the same thing. You will just pay less for the Brunswick branded cans. Just FYI, the brunswick packages are smaller. They have 5 crackers instead of 6, and less salad as well.